GUELPH, ON — Today’s statement from the local NDP candidate is not an honest assessment of the campaign in Guelph. 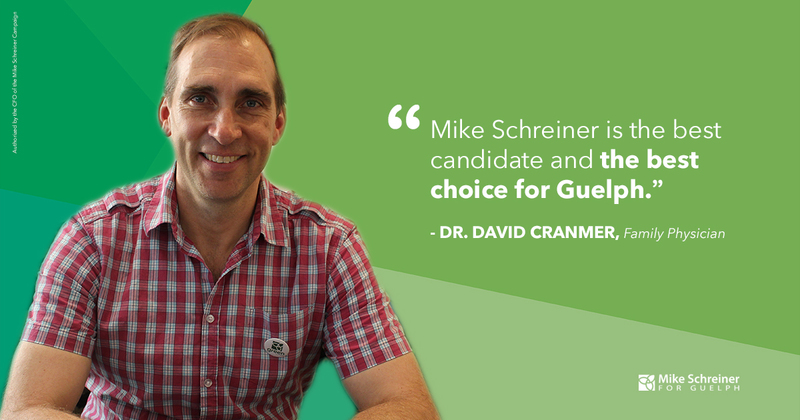 The NDP is clearly struggling to understand the math, which is showing that Mike Schreiner is the frontrunner for Guelph. Voting Green is a vote to stop Doug Ford. “These late-game scare tactics are politics as usual – stoking fear to harvest votes. I think we can do better. 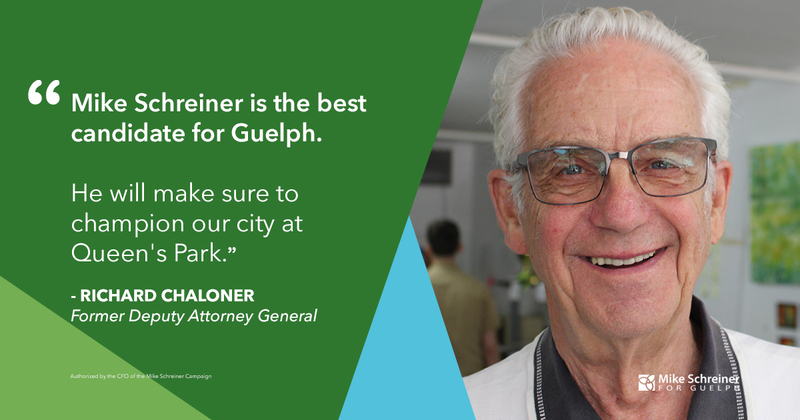 The people of Guelph have the right to vote for whoever they believe will serve them best. No one owns their vote. No one deserves their vote. Every candidate has to work hard to earn voters’ trust and respect in order to earn their vote. The NDP statement also misses the mark. Independent polls have consistently shown me in the lead. 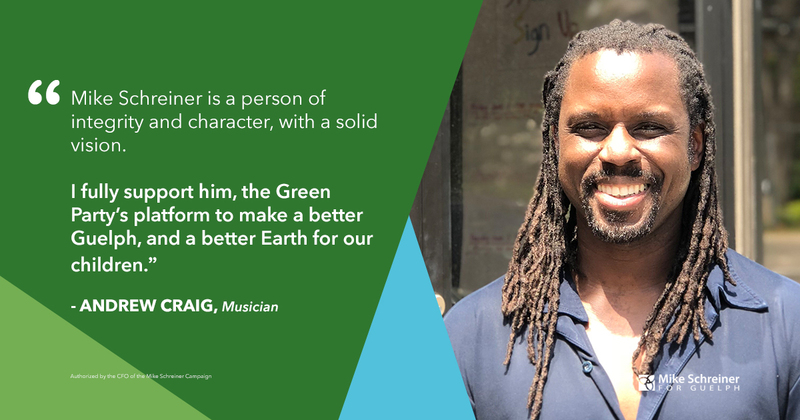 A Green vote is not a wasted vote. It is a historic vote. A Green or NDP vote in Guelph will stop Doug Ford. 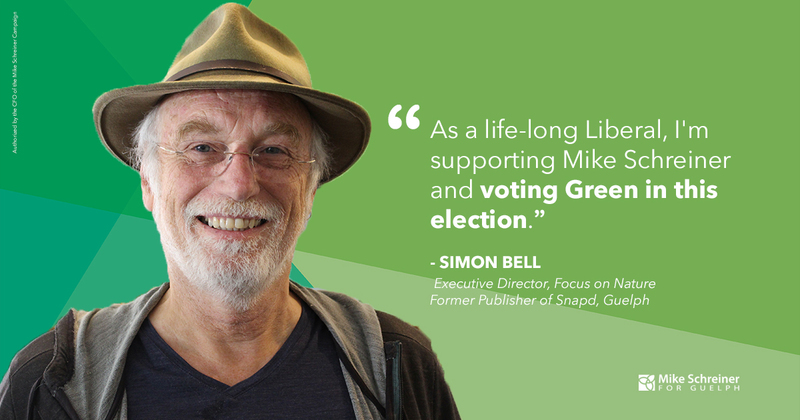 A Green vote might also prevent a PC or NDP majority. Voters across Ontario will make that decision. 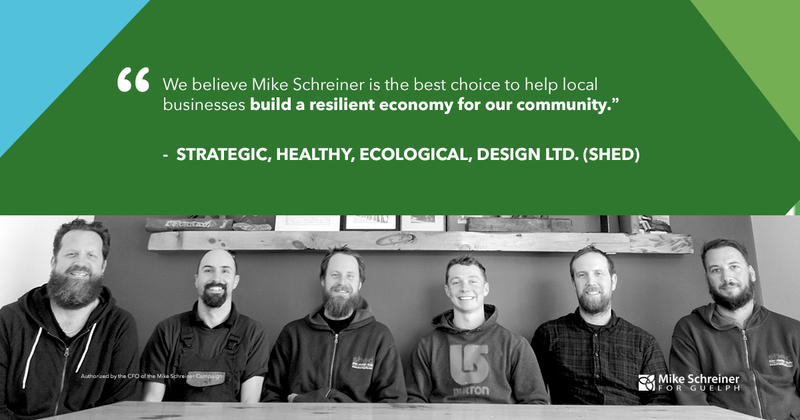 If elected to be your MPP, I will be a champion for Guelph, continuing the work I’ve already started as a local food, water and small business advocate. 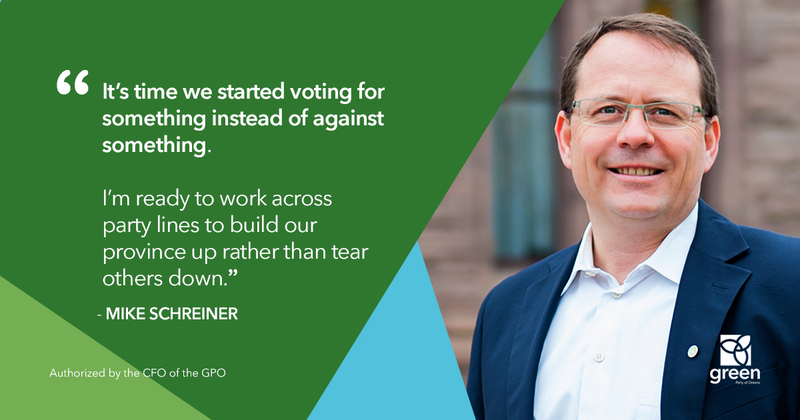 GUELPH, ON — Green Party Leader Mike Schreiner has received endorsements from a range of leaders in Guelph who are putting their backing behind him as the right candidate for the community. “I’m honored that people from all political backgrounds are rallying behind this campaign. It’s been building every day and we can feel the momentum. 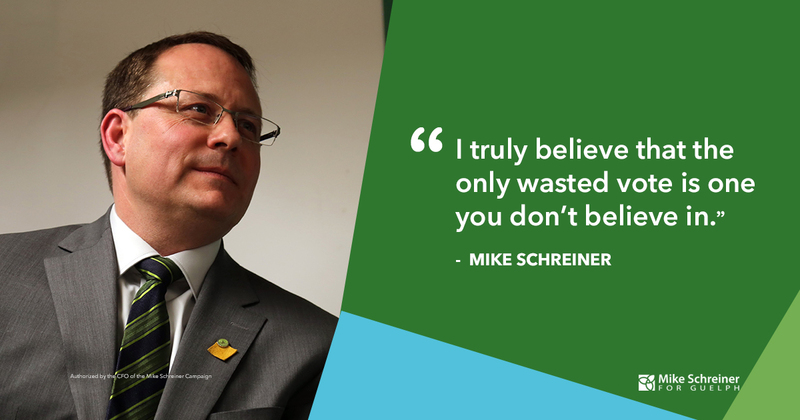 The feeling of disaffection with the status quo parties is clear and I am proud the Green Party is offering a hopeful vision that appeals to everyone,” said Mike Schreiner. 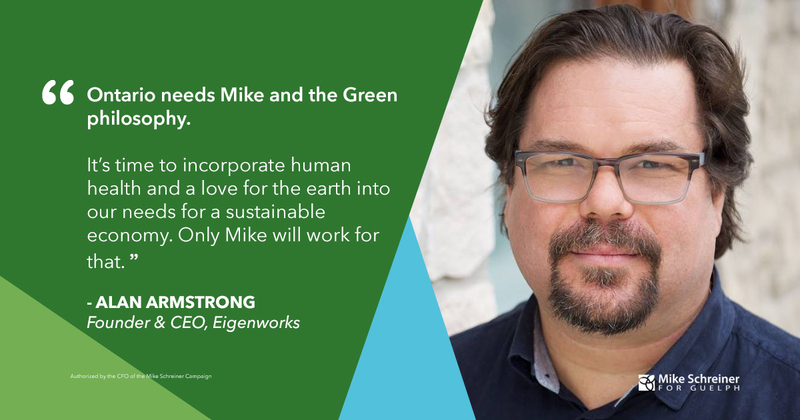 GUELPH, ON — On World Environment Day, we need a green leader now more than ever. One of the few things Doug Ford and Andrea Horwath share in common is a massive blindspot on climate change. 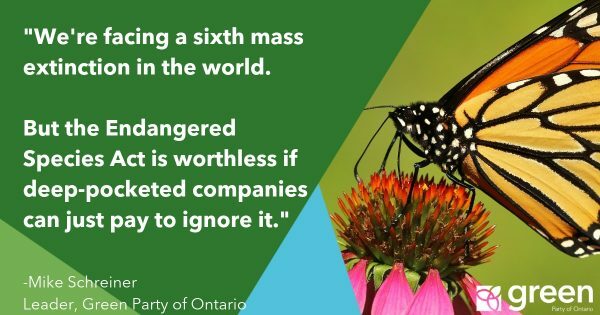 It’s one of the main reasons why we need Green MPPs at Queen’s Park. “Of the two parties fighting for power, one denies that climate change is even a problem, and the other ignores the crisis facing us. Instead of putting forward solutions, both Horwath and Ford are trying to outduel each other to lower gas prices, which does nothing but raise greenhouse emissions. 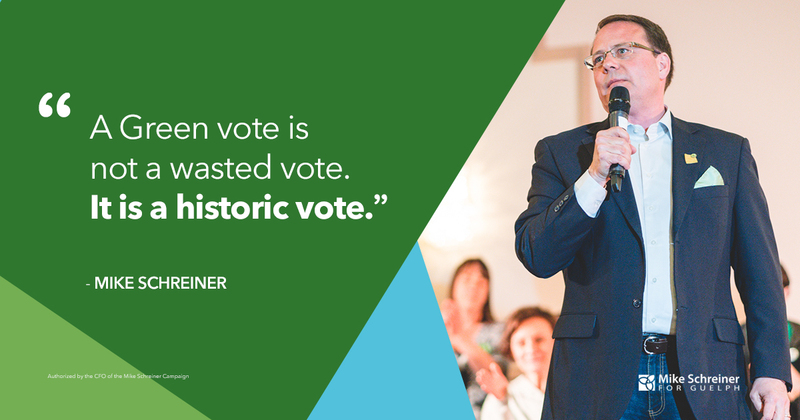 We need real climate solutions that put people first,” said Green Party leader Mike Schreiner. 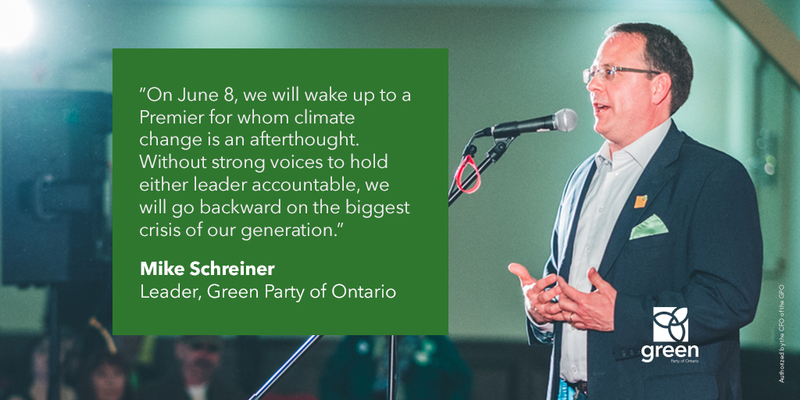 “On June 8 we will wake up to a Premier for whom climate change is an afterthought. Without strong voices to hold either leader accountable, we will go backward on the biggest crisis of our generation,” he added. Guelph is Ontario’s green capital, renowned for its community energy plan, water conservation and waste reduction efforts. 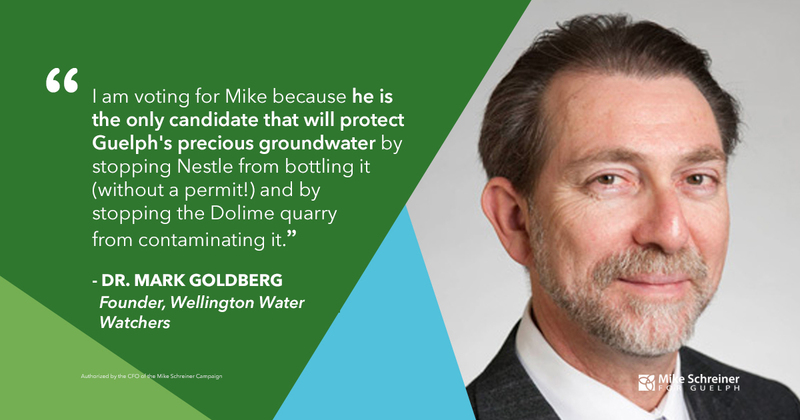 This kind of vision deserves to be reinforced by an MPP with the same values, an MPP who has dedicated his career to protecting Guelph’s water and who has a real and honest plan for reducing pollution. But instead of leaping into the future, both the NDP and the PCs are desperately holding onto the old economy. “Remember it was the NDP who in 2012 wanted to cut the HST from fossil fuels. It was the NDP who in 2014 opposed Wynne’s efforts to raise revenue for public transit, which would have reduced pollution from the biggest GHG emitting sector. And their 2018 platform is mum on emissions and renewable energy targets,” said Schreiner. If Ontario wants to move the needle on climate, we need Green MPPs applying pressure in Queen’s Park since we know there will be a leadership vacuum at the top. “I’m asking Guelph voters to think seven generations ahead. We’re on the verge of making history. Ontario is watching and Canada will be watching. 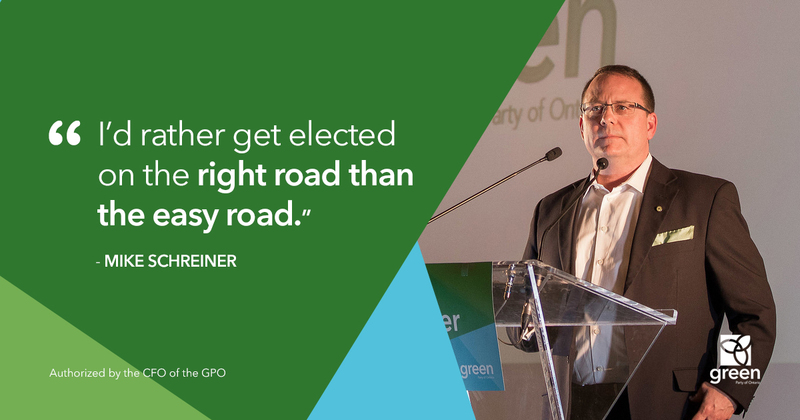 Electing a Green MPP can send a message that a new way of doing politics is possible,” said Schreiner. As you plant your garden this week, go to work and spend time with your family, I know you will be thinking about how you will vote on Thursday. It’s a big decision. So many people are telling me how frustrated they are with status quo politics, full of negative campaigning where the other parties spend more time tearing each other down than building Ontario up. I share your frustration. Politics should be about putting people first, ahead of party and ideology. I hope I’ve earned your respect by keeping our campaign positive and your trust by being honest about what we need to do and how we will pay for it. 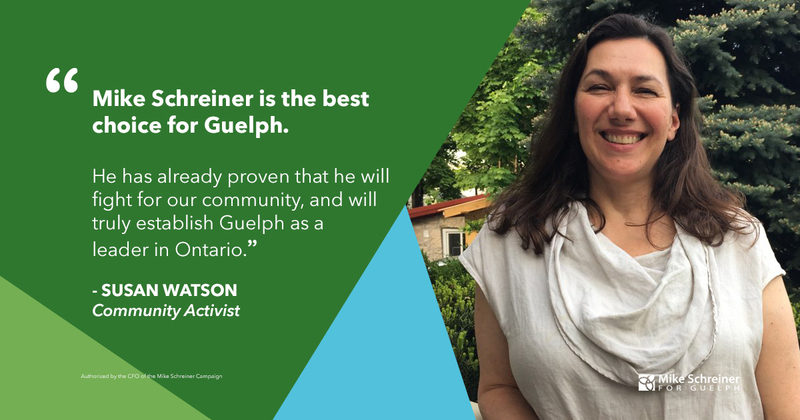 If you elect me, I will be Guelph’s champion at Queen’s Park, continuing the work I’ve already started: fighting to protect our water, improve health care, build better transit and help our local businesses thrive. 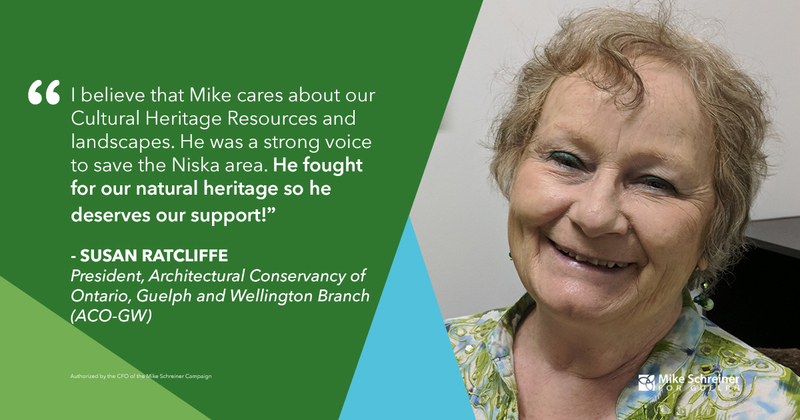 It would be an honour to be a strong voice for you in the legislature, just as elected Greens across Canada are standing up and speaking out for their communities. There is something special happening in Guelph. Our community is on the verge of making history. I will not wake up as Premier on Friday, but we’re writing a different story here. 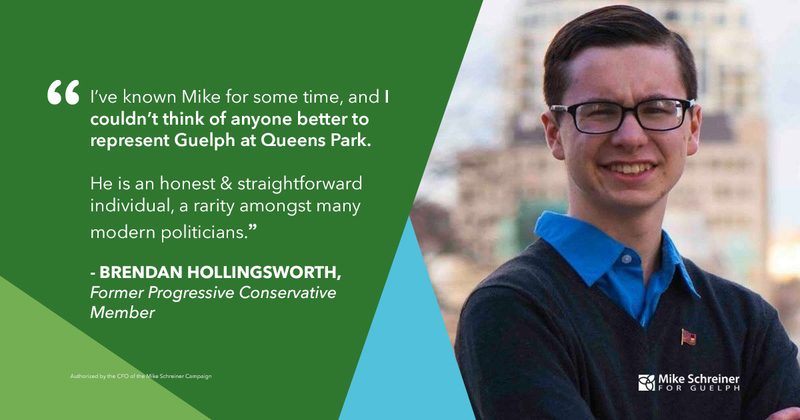 Sending a new party to Queen’s Park signals real change. It tells Ontario and Canada that a new way of doing politics is possible. 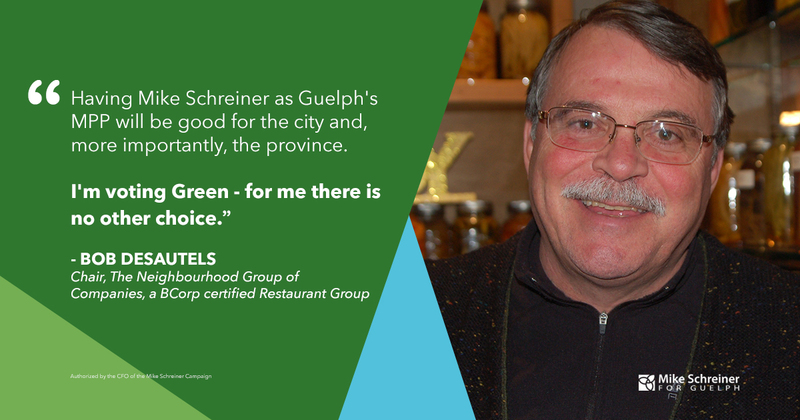 Guelph can lead that change. I know you’re disillusioned by politics as usual at Queen’s Park. I will work hard to change that. 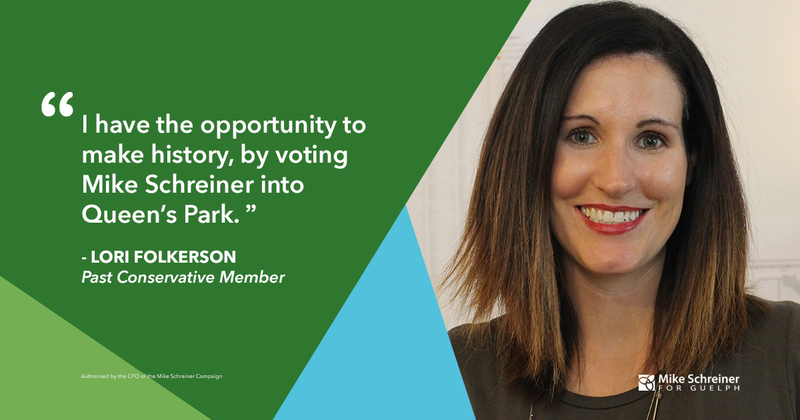 As your MPP, I promise to work across party lines, represent you first and hold the government to account. I have a proven track record to do this for you. I truly believe that the only wasted vote is one you don’t believe in. In Guelph, a Green vote will have the same effect in stopping Doug Ford as an NDP or Liberal vote will. So, you don’t have to vote out of fear. You can be proud of your vote. I sincerely hope that I’ve earned your trust and your vote on June 7. It would be an honour to serve you. Mental health and addiction services should be part of OHIP. 12,000 children across Ontario are on a mental health waiting list. Guelph has seen a 50% increase in emergency room admissions for mental health and addictions, where people wait for days to see someone.The time to act is now. Today I announced our plan for an historic $4.1 billion investment as a down payment on making mental services part of OHIP+ because mental health IS health. 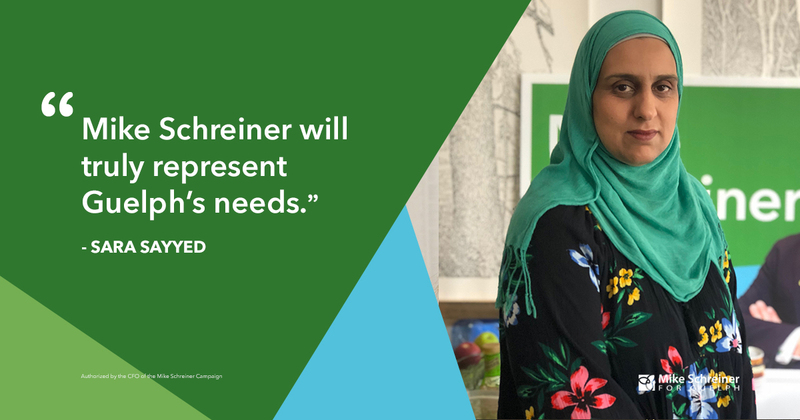 GUELPH, ON — Today, Mike Schreiner announced plans to make mental health a pillar of Ontario’s healthcare system with an historic $4.1 billion investment, more than any other party this election. “Over the last four decades, there have been 17 government reports on how to address mental health and addictions, and yet successive NDP, Conservative and Liberal governments have failed to follow through. The time to act is now,” said the Green Party leader. Guelph has seen a 50% increase in the number of emergency room admissions for mental health and addictions issues. A 2016 study showed that 95% of patients in mental distress who were admitted to Guelph General Hospital’s emergency room on a Saturday were still there on the Monday. Across Ontario, 12,000 children are on a mental health waiting list. “Mental health is health and it should be treated as such. 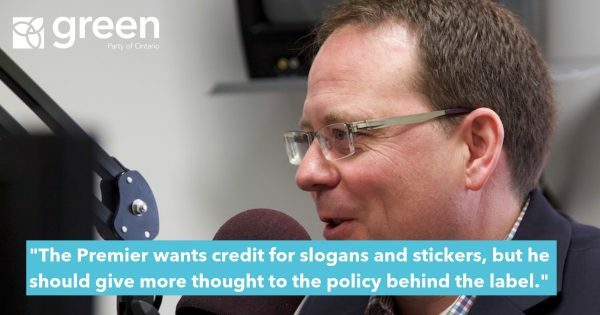 Our $4.1 billion dollar pledge is a down payment on making mental health covered under OHIP+,” said Schreiner. Greens are also calling for the creation of Mental Health and Addictions Ontario, an umbrella organization to streamline the provision of services, and they want to see more people accessing services at the primary care level rather than waiting in hospitals in crisis. 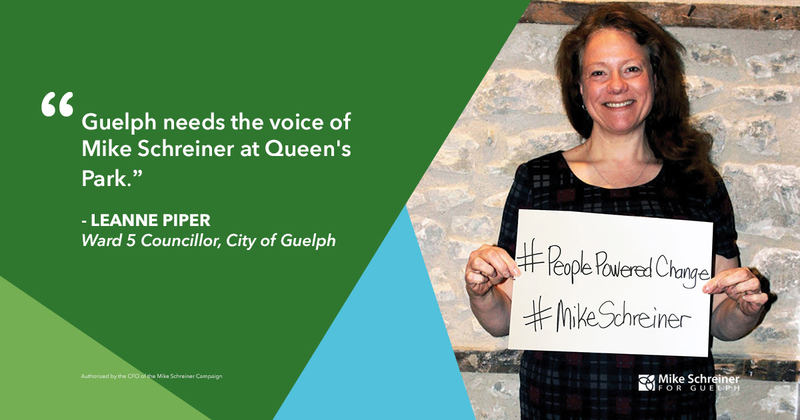 “As Guelph’s MPP, I will be a champion for community based mental health services. 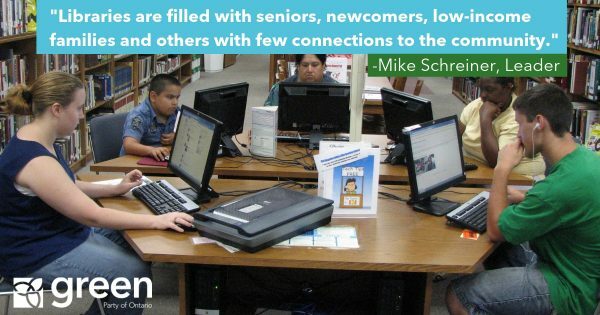 People must receive the care they need in an affordable, accessible and timely way,” said Schreiner. And the Greens don’t look at mental health in isolation. Greens also promise to introduce a basic income guarantee and additional funding for supportive housing for people in need. “We need to ensure that no one falls through the cracks. We cannot ignore the social determinants of health and the role they play in our poverty and mental health crises,” he added.